Hitting the slopes for the first time? Here’s what you should know to stay safe and come home in one piece. If you’re new to skiing or it’s your first time on the slopes since last season, listen up. When you’re hurtling down the mountain and you lose control, there are tons of ways to get hurt, and the last thing you want to do hit a tree (or another person) and take a bone-breaking tumble. With these simple tricks in mind, you’ll make it home from your ski trip unscathed—and be able to hit the slopes all season long. Priming your muscles before the snow even falls will prep you for skiing’s intense quad and hamstring workout. Plus, cardio is important because it’ll help your body adjust to the mountain altitude. A lot of skiers live at sea level, then head up to the mountains come winter. If you aren’t in good shape in the low elevation, moving up will make any exercise even harder. You’ll feel light headed at high altitudes because your body works harder to spread oxygen to your cells. But if you work out year round, you will already have a good base for your cardiovascular fitness to help curb the side effects. You might want to follow your friends to the tougher hills right away, but even experienced skiers need to take it easy for the first few runs. One of the biggest mistakes skiers make is wanting to go to steep terrain too quickly. Give the easier runs a try to learn new movements and perfect your technique, then challenge yourself to the harder runs. You need to develop turns on easier terrain and then apply that to steep terrain. Before you advance to steeper runs, be confident with your turning skills and ability to stop. Practice the skier code of conduct. You might not realize it, but getting on and off the lift is prime time for getting injured if you’re not paying attention to how it works. 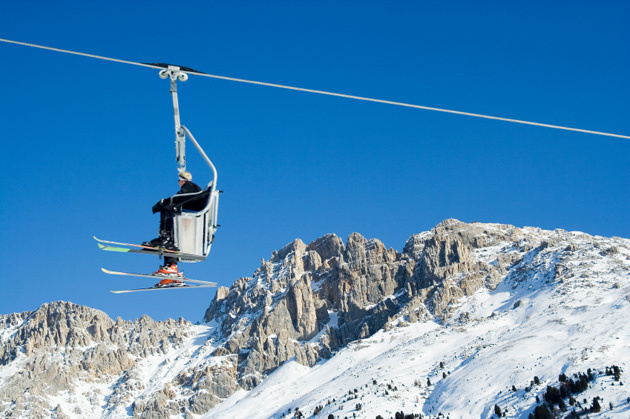 Lift usage is included in the skier code. When you are entering a liftline, make sure you know how to use that particular chair. Newer lifts will come to pick you up slowly, but some of the older machines won’t run as smoothly or slowly. Pay attention to what you are doing and what the chair is doing, and loading should be a cinch. Typically, people are going to get hurt themselves late in the day when they are tired and heading back to the lodge. Be aware of how you are feeling — take a rest when you need to, and make sure you load up on plenty of water or sport drinks before, during, and after your time on the mountain. People try to fight the fall by holding themselves up, and that’s when the ligaments tear. If you do start to fall backwards, it is better to sit down than resist it. Stay conscious of your form, especially when you feel tired or are coming off of steep runs to a flat area. If you zone out, and you might get hurt. Another appropriate time to sit down? If you’re speeding down a run, out of control. Sitting down will slow you down, and help you gain control before you run into another person or a tree. Lessons keep your technique moving in the right direction and help prevent bad habits. It’s recommended to take refresher lessons once a year or every other year for experience skiers, because lessons will sharpen up your skills on the little things that matter, like making sure you are balancing over your whole foot instead of leaning back in your boot.